The title says it all. Some researchers have built a robot that is controlled by your mind. Some software needs to be trained to recognise the individual thoughts, but then the robot can respond to those thoughts as commands. Pretty cool ay? Rajesh Rao is a man who believes that the best type of robotic helper is one who can read your mind. In fact, he’s more than just an advocate of mind-controlled robots; he believes in training them through the power of thought alone. His team at the Neural Systems Laboratory, University of Washington, hopes to take brain-computer interface (BCI) technology to the next level by attempting to teach robots new skills directly via brain signals. 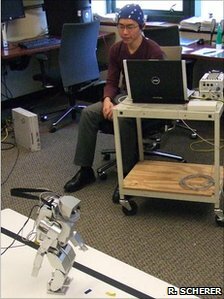 Robotic surrogates that offer paralyzed people the freedom to explore their environment, manipulate objects or simply fetch things has been the holy grail of BCI research for a long time. Dr Rao’s team began by programming a humanoid robot with simple behaviours which users could then select with a wearable electroencephalogram (EEG) cap that picked up their brain activity. The brain generates what is known as a P300, or P3, signal involuntarily, each time it recognizes an object. This signal is caused by millions of neurons firing together in a synchronised fashion. This has been used by many researchers worldwide to create BCI-based applications that allow users to spell a word, identify images, select buttons in a virtual environment and more recently, even play in an orchestra or send a Twitter message. I’m aware that mind control isnt a new thing by any stretch of the imagination, but normally it onl y resides in huge research facilities with huge budgets to build these things. Hence the best part of my hack, it’s super cheap. This is very cool though isnt it? Controlling a real object through thought alone, without moving your arms at all, this robot just reads your mind and bends to your will. So cool. I honestly think thats things like this will be the future of interfaces. But maybe not this alone. This combined with gestures/mulitouch, speech recognition and other things will probably end up being the main control mechanism for everyday household computers. They traditional computing interface will become something that exists in the office or workplace and used for data input or production. Thats the thing really, these interfaces are completely useless for media production, so it’s quite hard for me to imagine using something like this sometimes. But imagine having things around your home being controlled by thought, the lights, heating, tv, butler robot, that’s the real, most likely future i think. That or the games market, as long as the price to buy these things comes right down so it’s akin to a guitar hero controller then yeah, why the hell not? My only downside comment about this thing is the training aspect. Yes, I know, everyones minds arnt the same so it needs someway to recognise individual thoughts, but, people are lazy. Even people like me who really, really, really want to own this stuff will be annoyed at the fact you have to spend hours or perhaps even days coaching the damn thing to know how you think. That’s kind of the plus side of the toy I’m using. It’s super simple to use, no training at all to work it. You just put it on and away you go. It’s odd how a toy can do that really. I guess it’s down to the fact that it only reads two very simple brainwave values rather than everything down to individual thoughts and emotional responses to objects. Yeah, just give me the lab version headset please. I don’t mind training it up on second thoughts. Thanks.